EPA studies have shown that pollutant levels can be higher indoors than outside. Where are many of these pollutants coming from? Your floor. Installation materials, chemicals used to treat flooring, cleaning products, and sometimes the material of the floor itself all pollute the air around you. The good news? Flooring manufacturers are becoming more and more sensitive to environmental issues with their products. They are developing new lines of flooring made from sustainably harvested, recycled or reclaimed sources. These eco-friendly floor options are environmentally responsible, better for your health, and often less expensive than conventionally made flooring. 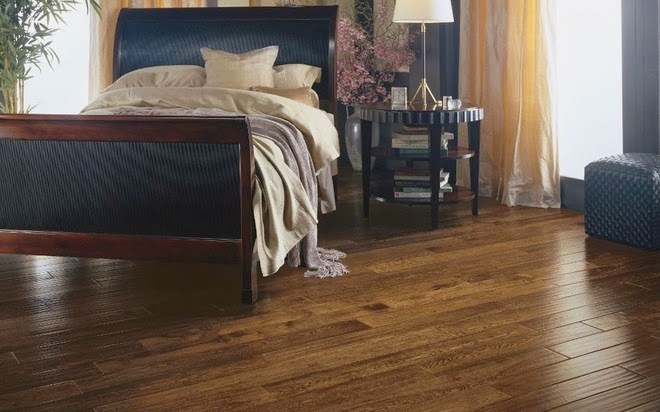 When made from sustainable resources, wood floors are one of the most environmentally friendly floor options available. Wood floors can be good choices for the earth's environment and your personal environment as well. Wood floors don't trap dust and other allergens that can cause health problems - particularly for those with allergies, asthma or other breathing disorders. Cork wood flooring is an excellent eco-friendly choice because it is made from the bark of trees that grows back and regenerates itself within three years. Cork is also a natural insulator (helping your home stay warm or cool more efficiently). And cork floors are naturally hypo-allergenic too! Another popular "green" wood floor is bamboo. Bamboo grows quickly and in large quanities making it perhaps the most sustainable of all wood floor choices. Even traditional hardwood floors can be an environmentally friendly choice when they are made from sustainably managed forests. Tile floors are good for your indoor environment because they are resistant to water (and thus resistant to mold and mildew) and do not trap dust or other allergans. However, the manufacturing process of some tile makes this a slightly less environmentally friendly choice than wood flooring. Some tiles - terrazo and glass in particular - are made from recycled materials which is a great way to be eco-friendly. Ask questions about where the tile was manufactured and what materials will be used in its installation. Carpets are notoriously bad to the environment. From the materials used to make them to the chemicals used to install them, carpet is not the friendliest option for the environment. However, today's manufacturers are working hard to develop yarns made from sustainable materials, use environmentally friendly materials in padding and find better choices for installation. Don't walk away from carpet when you're looking for environmentally responsible flooring, but do ask questions. When you're looking for floor that is friendly to the world, your home, and your wallet - look no further than Kermans. We invite you to shop our wide selection of flooring in our showroom on the northside of Indianapolis. Talk to our design staff about your concerns and flooring needs and we'll help you find floor that is just the right fit.